Andrea hill 4/2010, originally uploaded by JohnGiez-. Despite the fact that I’m usually solar powered when it comes to work and the sky was drearily gray and threatening rain and it was quite cool again today, I felt strangely energetic rather than lethargic. Maybe because the northern properties of Ryan, Andrea and Jacob are some of my favorite in the whole system. 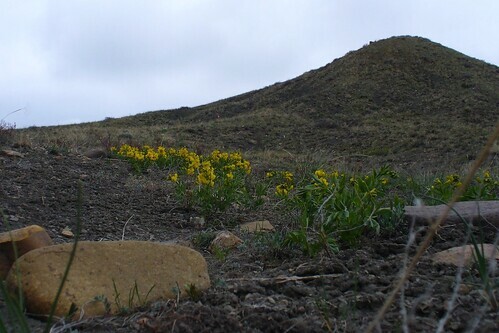 They feel remote and quiet and there’s a beautiful valley surrounded by hills whose steep slopes bear dark shale, the favorite habitat of the endemic Bell’s twinpod (e.g. these and these). It was the first place I saw a sand lily, and on this day another flower new to me. So despite the abundant cacti and steep slopes I always enjoy working in this area. This morning as we attempted a difficult grid around one of the hills we were serenaded by snipes, whose ethereal call always seems nearby and all around even though the birds themselves are difficult to spot. And a peacock or two on a nearby farm, whose blaring cry is better suited to a humid jungle and reminds me of the Denver zoo. And a little later, a rooster’s crowing, the sound of which, after all these years, still reminds me of daybreak in The Legend of Zelda: Ocarina of Time. We found noticeably less Med sage than in my previous summers, a welcome change, and I always enjoy the great view to be had from the hilltops. Turning to the east, away from the valley, you can see a tipi on another hill a ways off, and to the south, two giant radio dishes at the table mountain antenna site. It always seems surreal to me, to be in a grassland well outside the city where the sparse human inhabitants operate goat dairies and pick-and-pay organic vegetable farms, and here are these monumental pieces of advanced technology just sitting on the hillside, isolated from any obvious origin, purpose or user. Kind of sci-fi. Also, the rattlesnakes wisely stay inside when it’s cold. At the corner of sapling and nowhere 1 at the corner of sapling and nowhere 1, originally uploaded by JohnGiez-. A corner of a hypothetical street yet to be built, slowly going back to nature in the meantime.